Readers asked and I like to deliver. Here is one of two desserts* I made for our family Easter (the first of two family feasts: I will be celebrating again next weekend with my Greek in-laws as the Orthodox calendar delivered Easter a week later this year). Preheat oven to 350ⓕ.Draw a 9-inch circle on piece of parchment paper with pencil. Flip paper over and lay on large baking sheet. 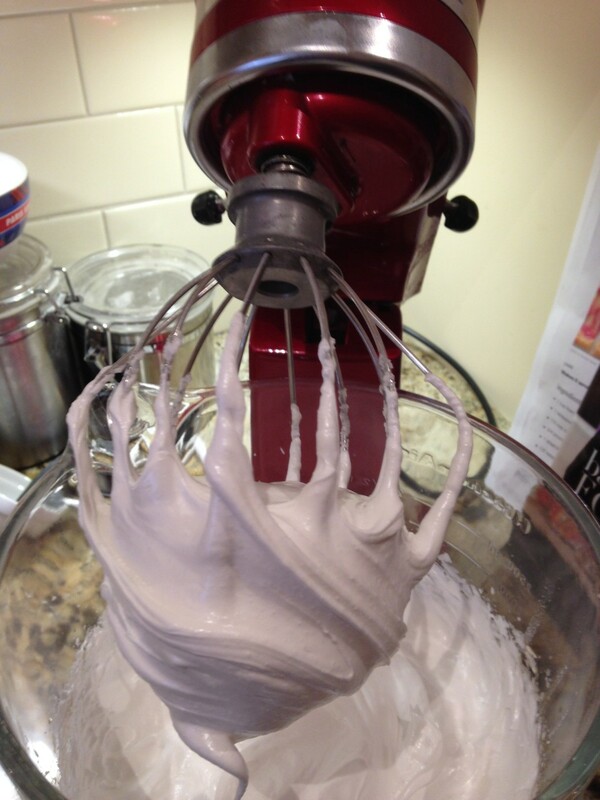 Beat egg whites in mixer until soft peaks form. Begin to add the sugar a little at a time, and continue beating until stiff and shiny. 3. Carefully fold in, with a spatula, the cocoa, sea salt, vinegar, and chopped chocolate. 4. Spoon the meringue mixture onto the parchment circle and use a knife to help smooth it into soft waves. Here you can design it however you wish. Pavlova’s aren’t meant to be perfect forms here unless you are doing individual nests, as I do for other desserts like my rhubarb kisses. 5. Place meringue in oven and immediately turn temperature down to 300ⓕ. Bake for one hour then turn the temperature off and open the door slightly (I use a wooden spoon to keep my door open). Leave meringue there with temperature off until it is dry for approximately another hour. 6. Leave the assembly until right before you serve as it takes only minutes to put together. Remove parchment from bottom of cooled meringue and place on a large serving plate. Whip cream with the vanilla and sugar until soft peaks form. Dollop it over the centre of circle and spread it out. 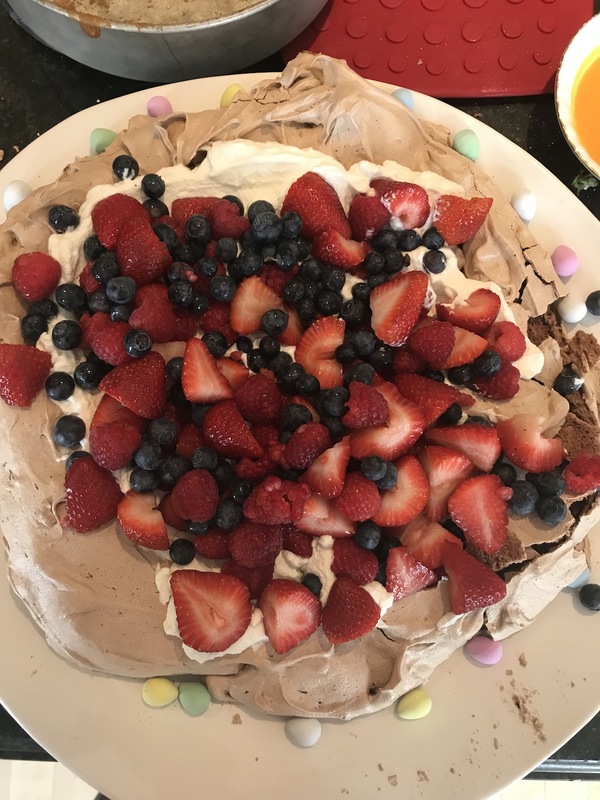 Dump all the berries in the middle and dust with the remaining chopped chocolate (if desired-I forgot to bring mine when I carted this pavlova to my sister’s house. It doesn’t really need it but don’t tell that to the chocolate lovers in the family). 7. Cut in wedges. This can be a sloppy serve, but nobody cares. It should serve ten easily. Leftovers (IF you have any) can be stored for a day or two in the fridge. 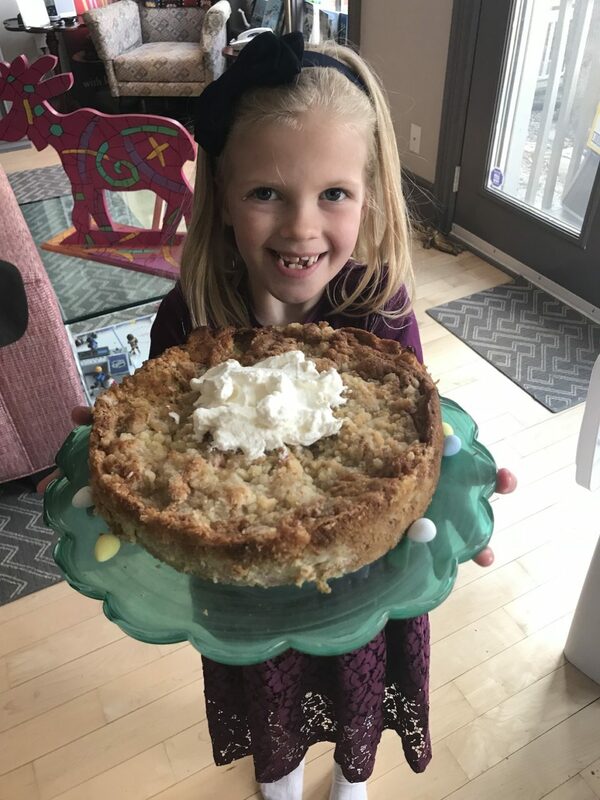 *The second dessert, equally beloved by family, is a rhubarb buckle I like to call the S0-Malicious Cake, so named as one of my young taste testers couldn’t pronounce ‘delicious’ and left a voicemail: Auntie Anne! That cake was so malishush! Yes indeed. So devilishly delicious it will kill any resolve you have for getting that summer bod ready. Malicious indeed.